Qu. (from M. D. KTE Karlsruhe): In using the platform Nucleonica I found some inconsistent data. 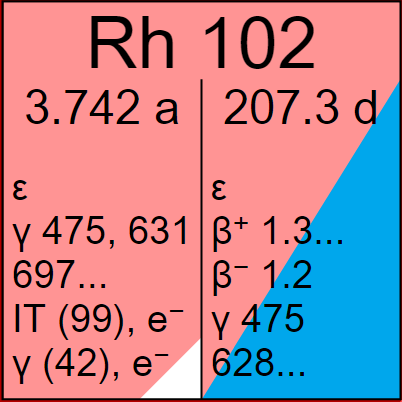 The half-lives of the nuclides Rh-102 and Rh-102m are not the same in the different specified databases. The half-lives of Rh-102 and Rh-102m seem to be inverted at „JEFF-3.1“ in comparison to „ENDF/B-VII.1“ or „Nubase 2012“. Do you have information which the correct data for these two nuclides are? Citation from the abstract of this paper: Beta-decay half-lives of the ground state and an isomer of Rh-102 have been determined 207.3(17) d and 3.742(10) y, respectively, by γ-ray decay curves following each β-decay. It has been found that a state (2−) which has a shorter half-life (207.3 d) is the ground state from the result that the half-life of the 41.9 keV isomeric γ-transition was equal to 3.742 y. It has also been confirmed that the 41.9 keV transition is certainly an isomeric transition with X–γ coincidence measurement. The data for Rh-102 in the new 10th Edition of the Karlsruhe Nuclide Chart, 2018. The data in Karlsruhe Nuclide Chart 10th edition, recent NUBASE file and ENSDF are based on this research. In JEFF3.1 the ground and metastable states were allocated incorrectly. We recommend to use the latest information based on the above mentioned research and summarised in the Karlsruhe Nuclide Chart as shown in the figure.